CBSS Page 2 - Snoopy And The Gang! 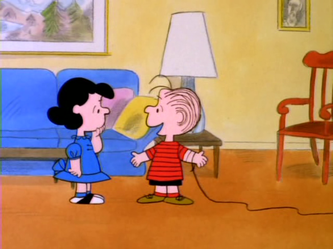 Charlie Brown and Lucy: Lucy spends her day playing cruel tricks on Charlie Brown, then she tries to give him advice in her own unique way. 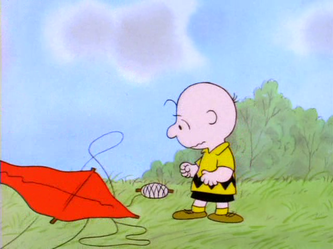 Kite: Charlie Brown is tackling his kite-flying problem. 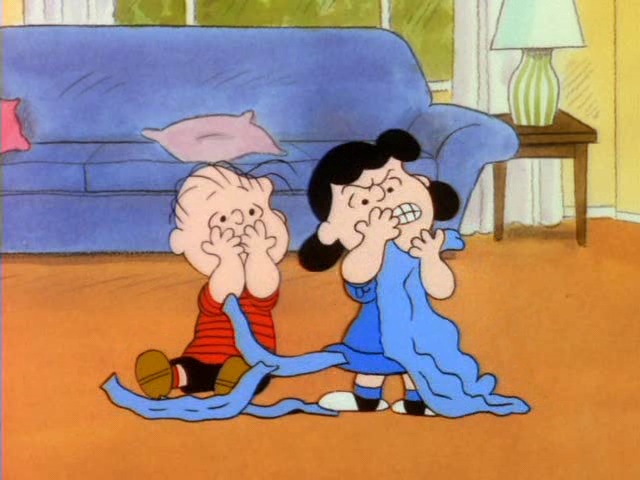 Linus and Lucy try to help. 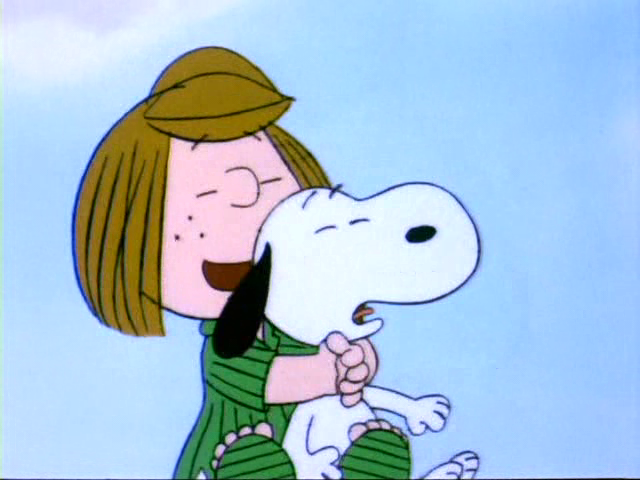 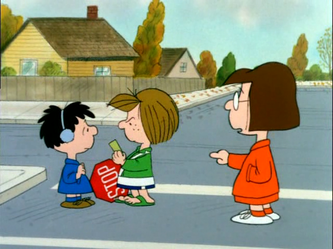 The Dance: Peppermint Patty invites Snoopy to a turnabout dance. 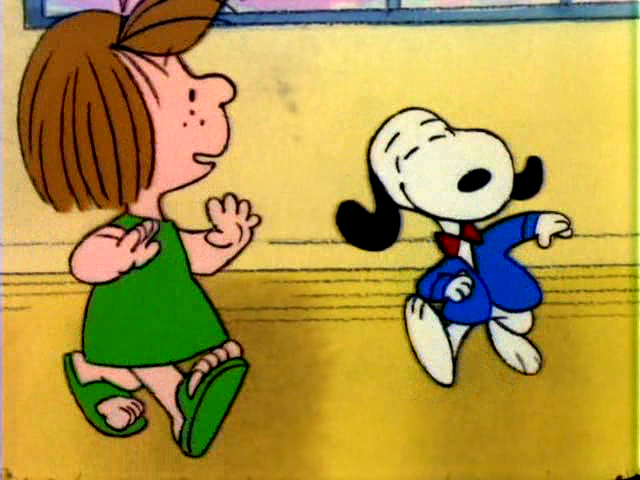 At the dance, she punches a boy for insulting Snoopy. 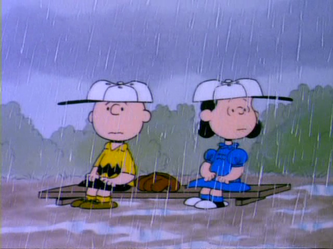 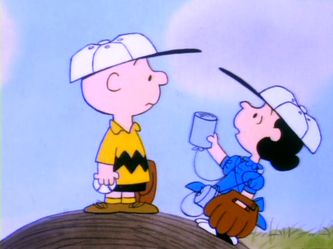 Thiebault: Charlie Brown is having a bad day in baseball. 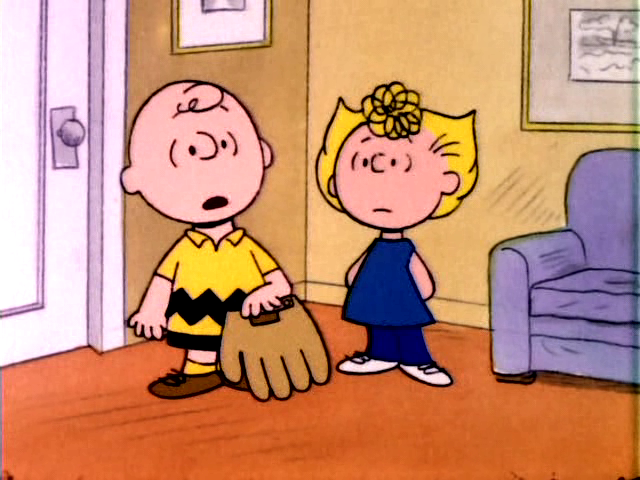 Peppermint Patty calls him up and asks if his glove can play in her baseball game. 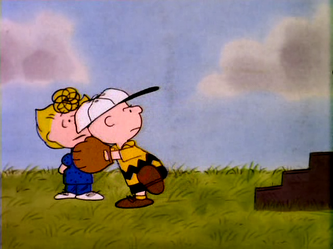 When the game ends, the kid who borrowed the glove refuses to return it. Marcie is asked to play in the game. 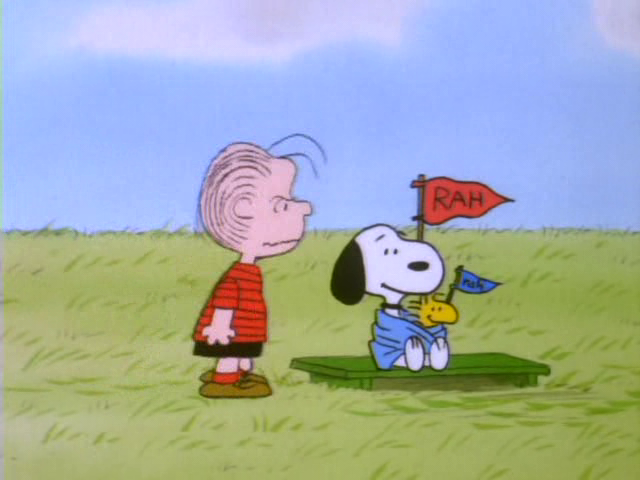 Note: I have no idea what this episode had to do with Snoopy being a psychiatrist, it wasn't even mentioned. 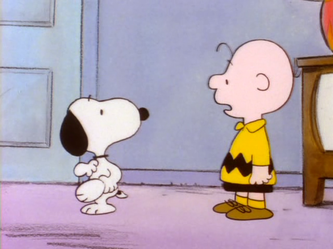 Shaking: Charlie Brown explains to Linus how mother dogs handle their puppies. 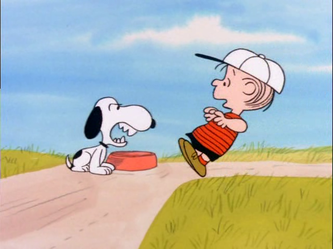 Linus doesn't understand, so Snoopy shakes him to get his point across. 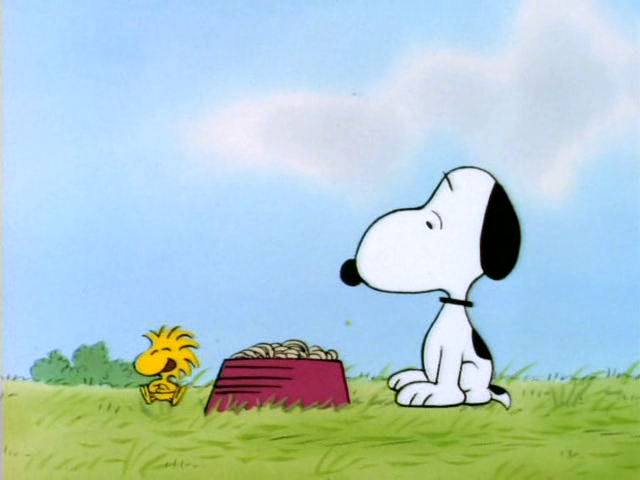 Spaghetti: Charlie Brown makes Snoopy a bowl of spaghetti. Woodstock ruins his appetite by talking about worms. Football: Sally tries to learn the game. 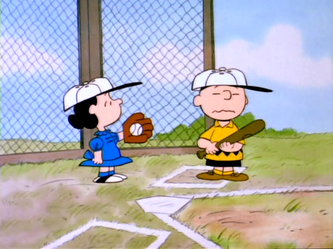 Baseball: As a favor to Lucy, Charlie Brown allows Rerun to play on the team. They win their first game, or so they think. 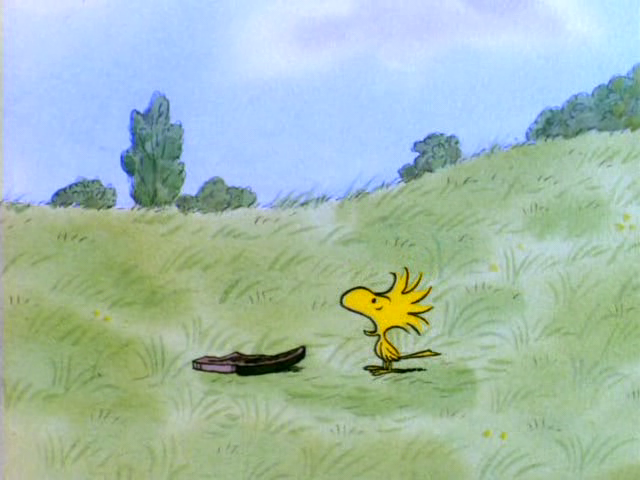 Toast: Linus burns his toast, so he throws it to the birds, who promptly refuse it. 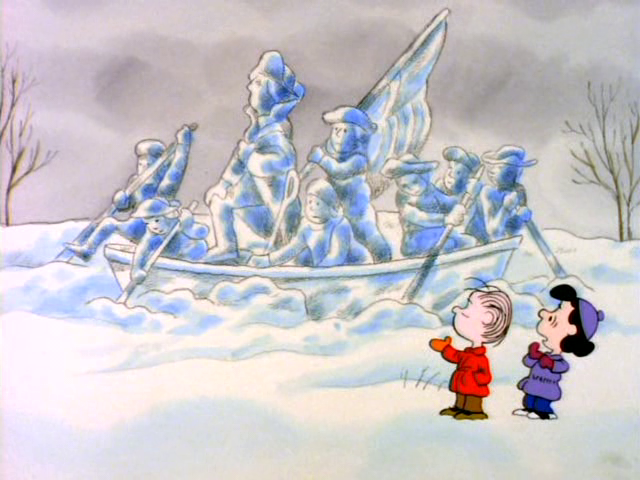 Snow Sculpture: Lucy sculpts her impression of George Washington, only to find that Linus has done something better. 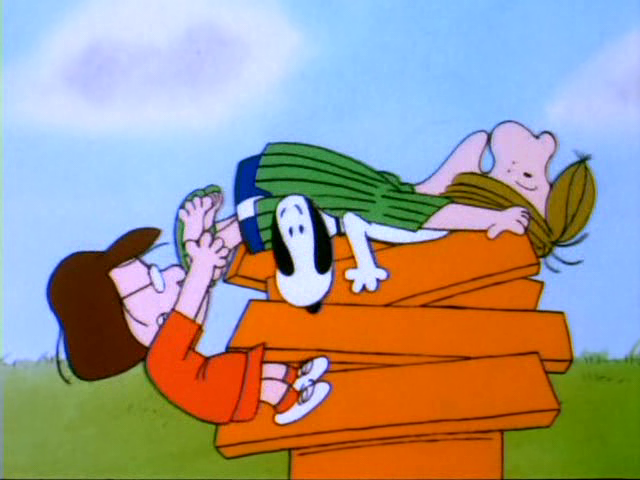 Sit: Charlie Brown tries to teach Snoopy to obey, with the expected result. 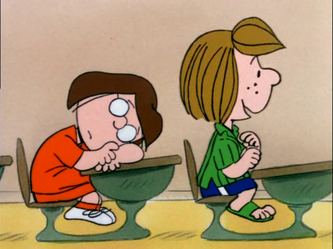 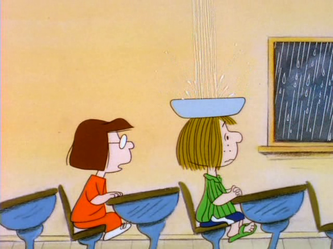 School: There is a leak in the ceiling at school, and Peppermint Patty is trying to make the best of it. 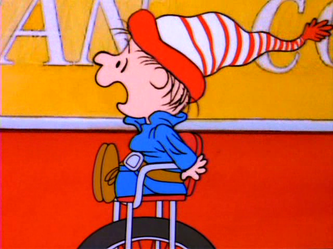 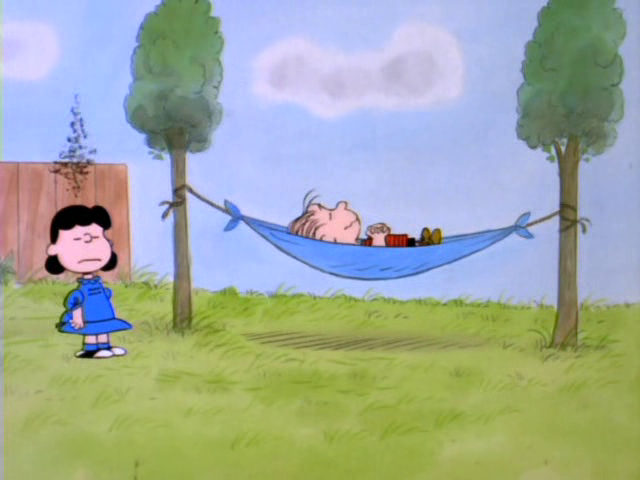 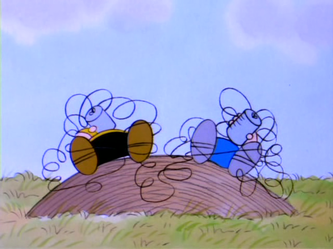 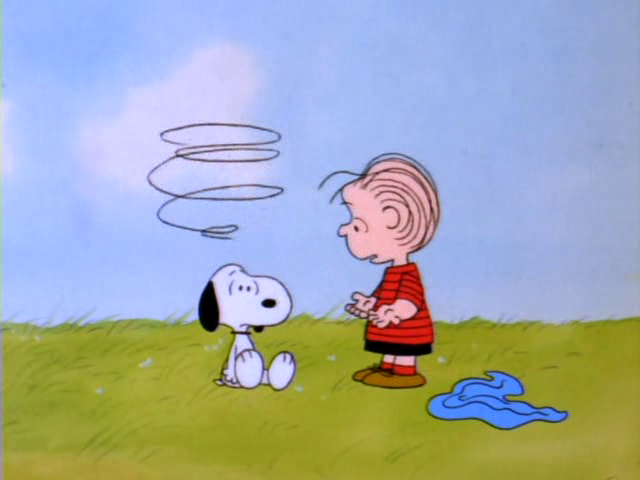 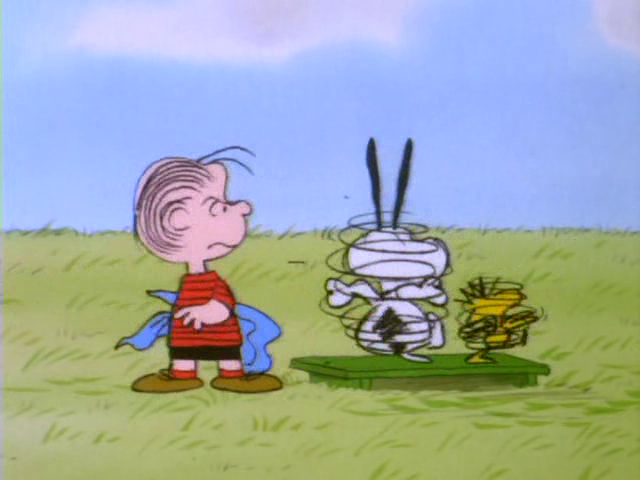 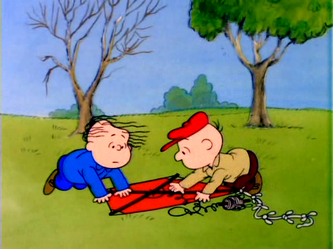 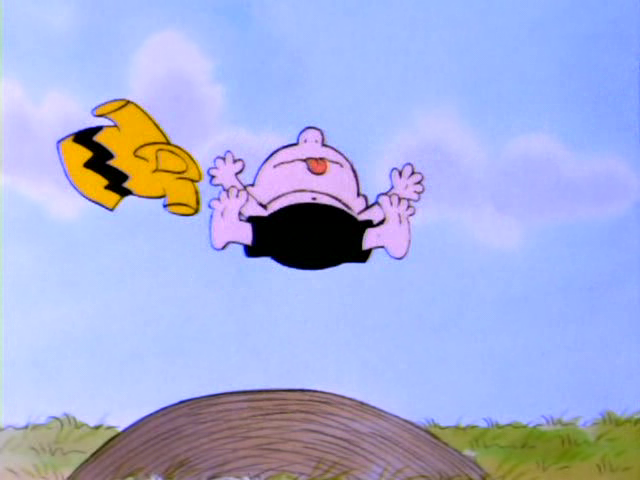 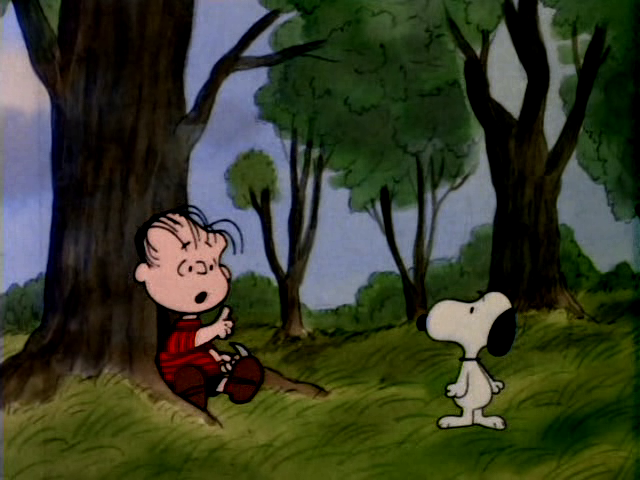 Kite: Charlie Brown makes several unsuccessful attempts at kite-flying. 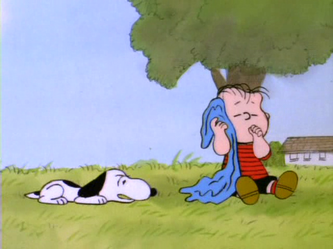 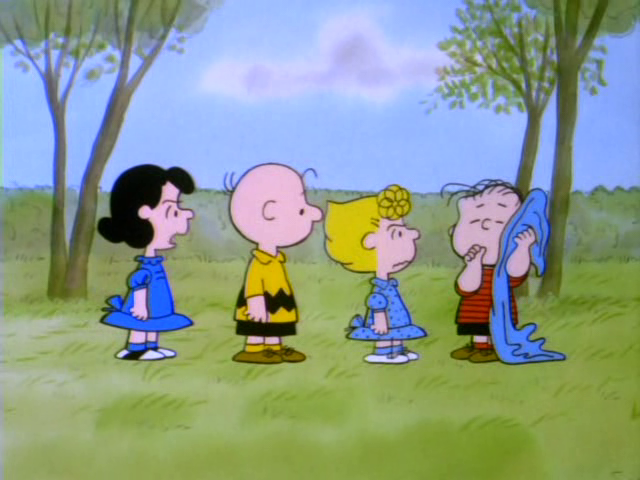 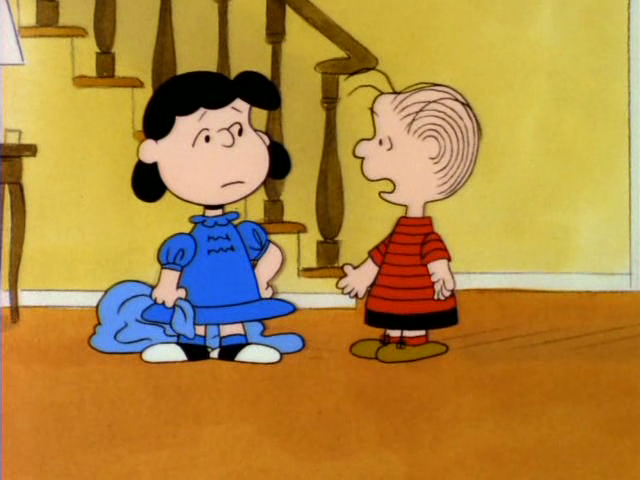 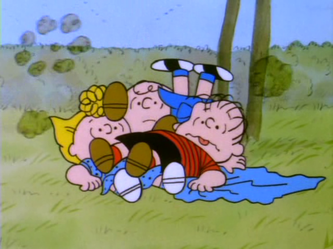 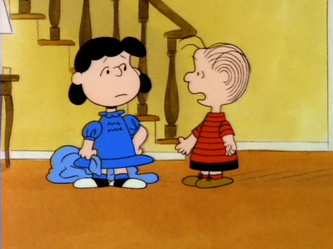 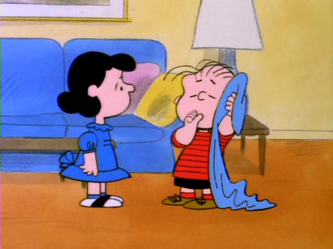 The Blanket: Lucy decides that Linus needs to give up his blanket, and puts him through a 2-week test. Sally: Sally has a not-so-easy day at school. 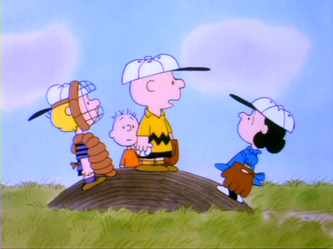 Charlie Brown wakes up one day to discover that their team can't play on the vacant lot they used anymore, due to insurance reasons. Gold Stars: Peppermint Patty is on a mission to earn gold stars. 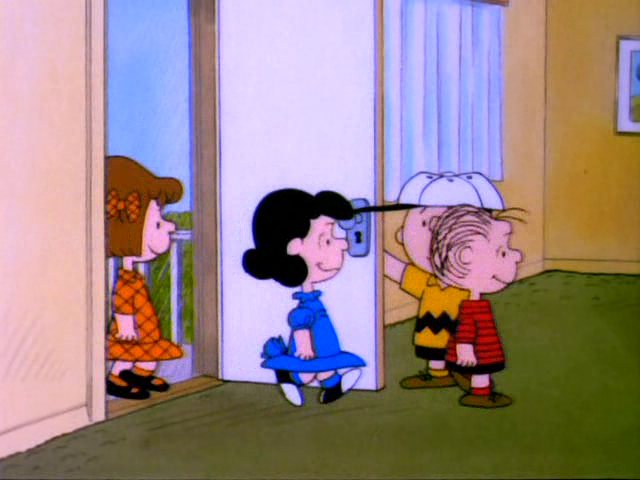 The box turns up missing after she borrows it, so she sets out to clear her name. Blanket: Snoopy takes Linus' blanket, and Linus has ways of getting it back. 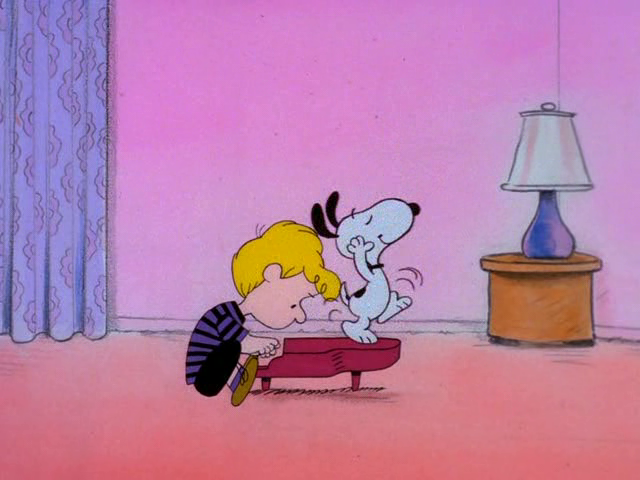 Piano: Snoopy simply loves Schroeder's piano playing. And Lucy just loves Schroeder. 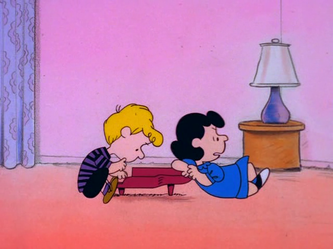 He doesn't return the feeling, so she throws his piano up a tree. 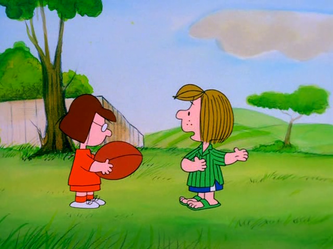 Teaching: Charlie Brown teaches Snoopy about football, Linus teaches Sally about football again, and Peppermint Patty teaches Marcie about football. 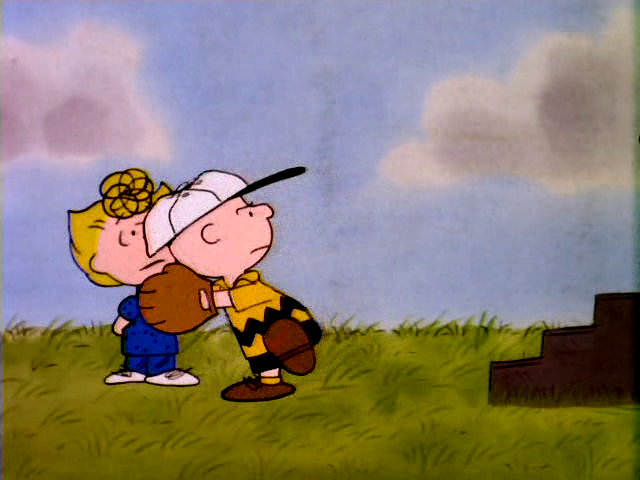 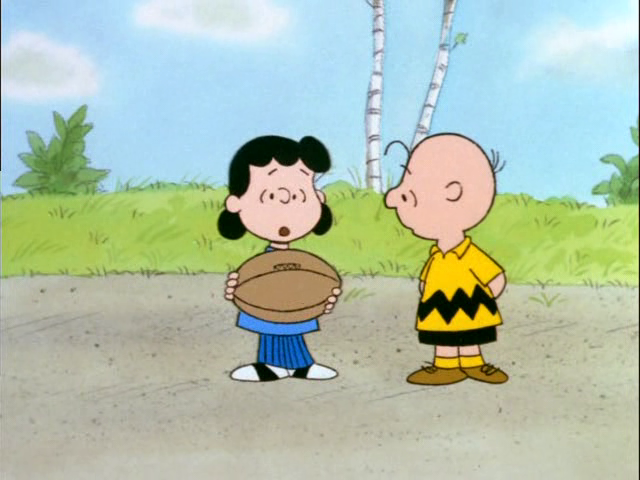 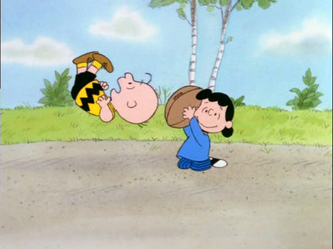 Finally, Lucy pulls the football away from Charlie Brown, yet again. 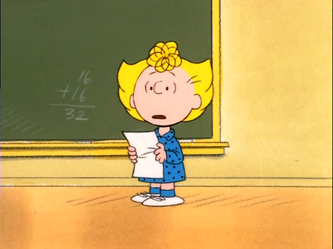 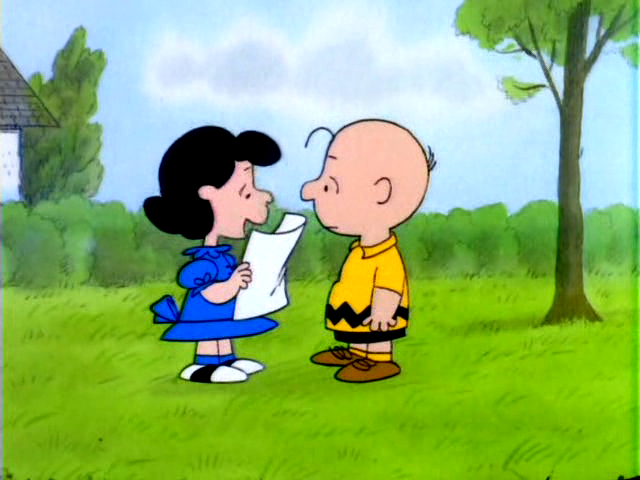 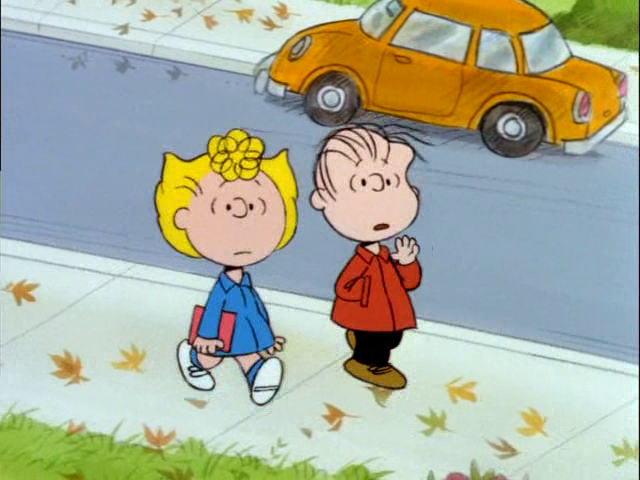 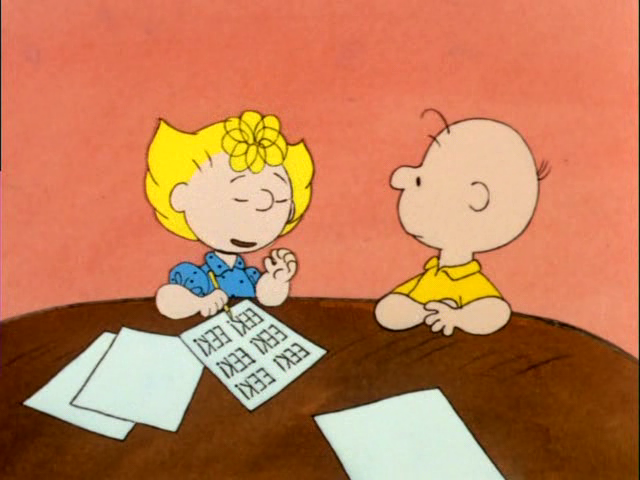 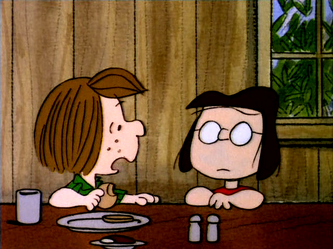 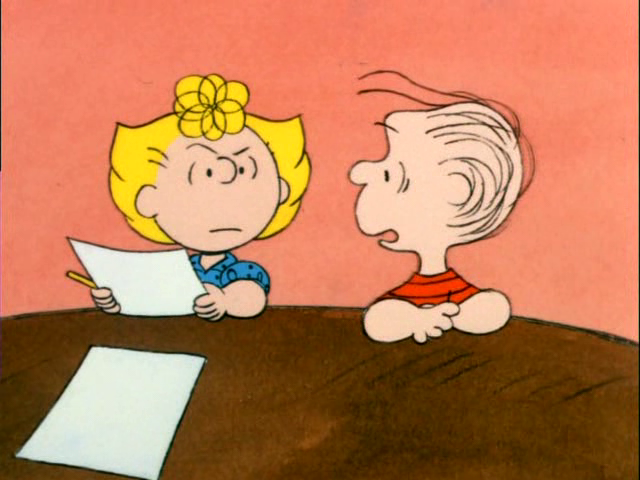 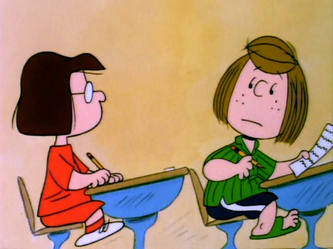 Sally At School: Sally talks about different school subjects to Charlie Brown. 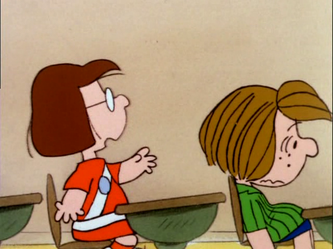 Unfortunately, Linus gets caught up in the discussion. She brings Woodstock to school for show and tell. Then, she borrows a kid's ruler and it accidentally gets broken, and he constantly bothers her to give it back, making her afraid to walk to and from school alone. 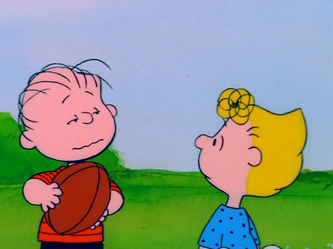 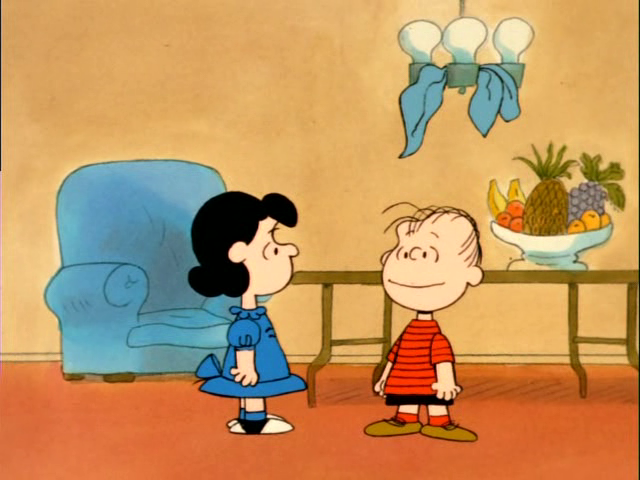 Football: Linus teaches Sally about football, yet again. (Didn't they keep track of this at all??) 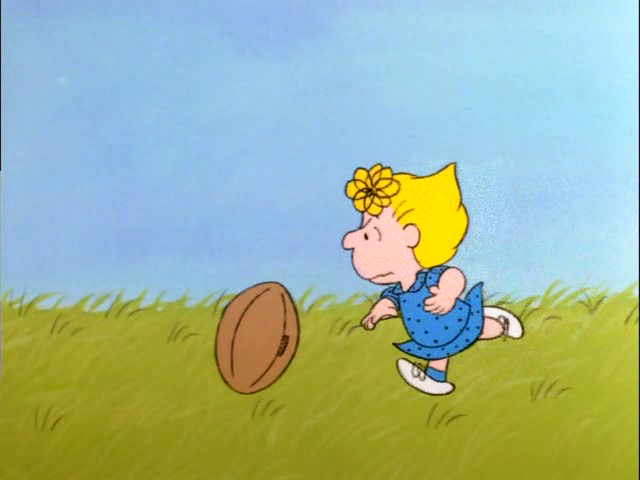 Then, the ball ends up in Lucy's hands, and you know what happens next. It then ends up with Woodstock, and he and Snoopy play for a bit. 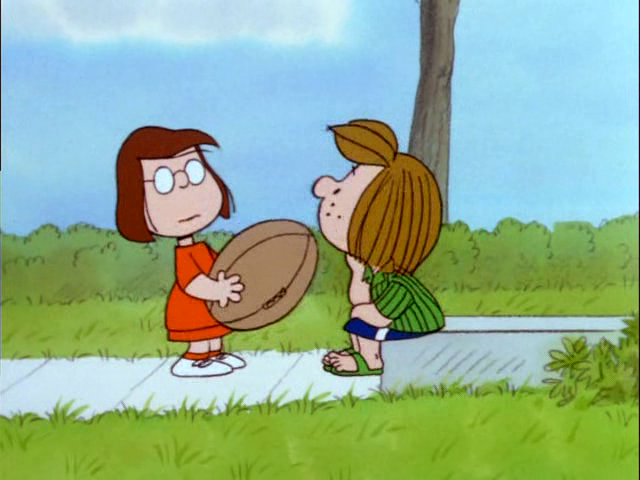 Then Marcie and Peppermint Patty end up with the ball, so it's basically a remake of the previous episodes, with different scenes. 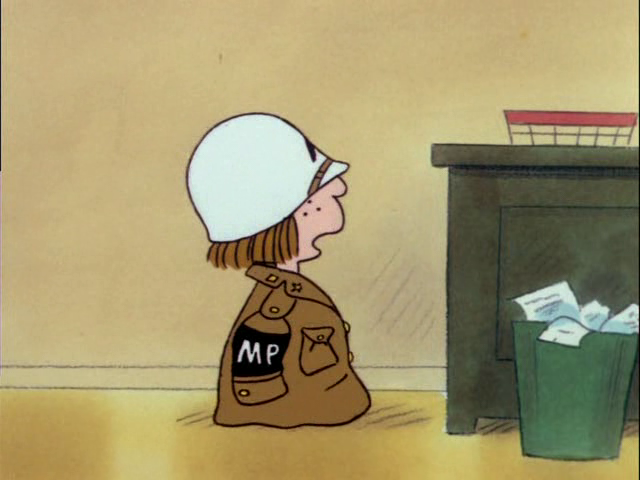 School Patrol: Marcie gets called to the principal's office, and she is made a patrol person. 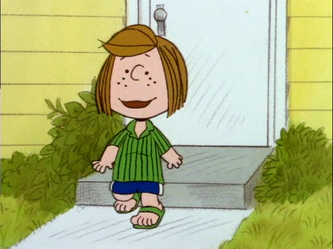 Peppermint Patty is jealous of this. 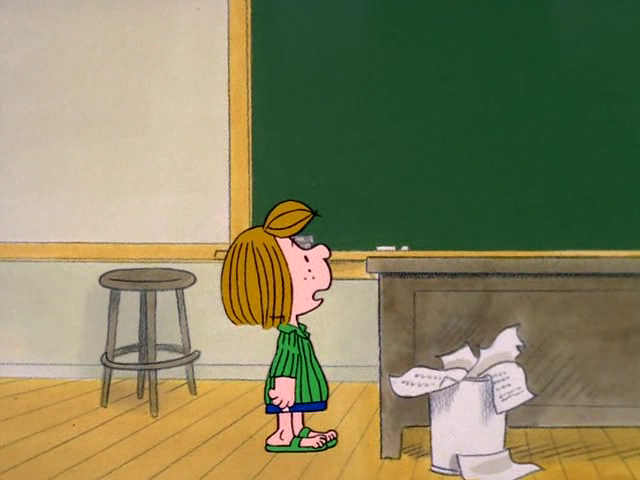 She then tries to persuade the principal to give her the job. 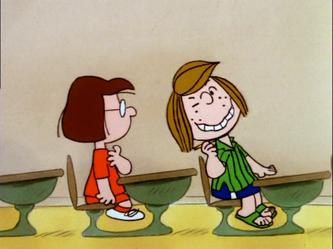 After Marcie falls asleep in class, she gets the job, but she is a bit too strict, and she loses it. 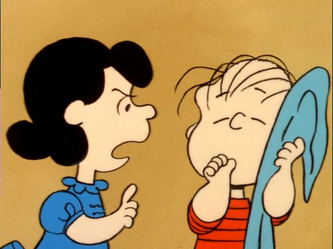 Blanket: Lucy accuses Linus' blanket of coming after her when he's not around, so he puts it out of reach. It attacks her anyway. Linus tries to get it to behave and call a truce, but it doesn't listen. 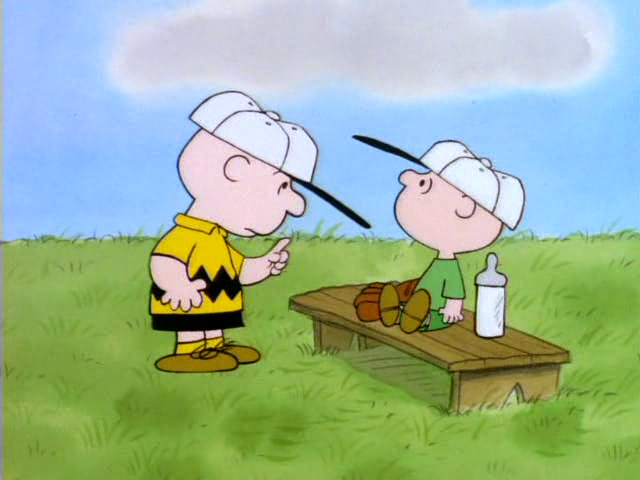 The Team: Charlie Brown borrows Snoopy's dog dish for second base, but he won't let anyone near it. 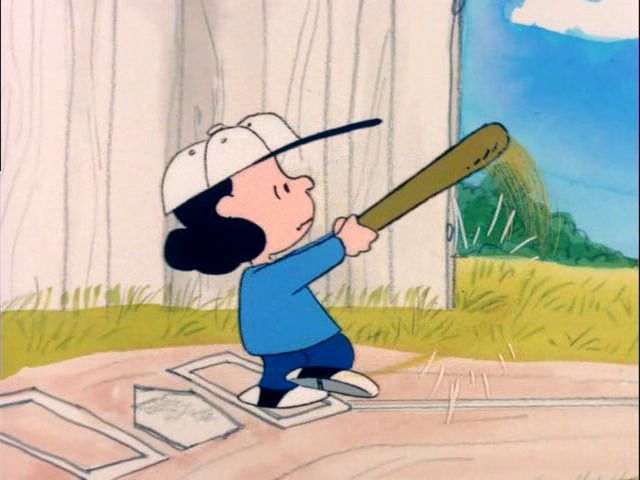 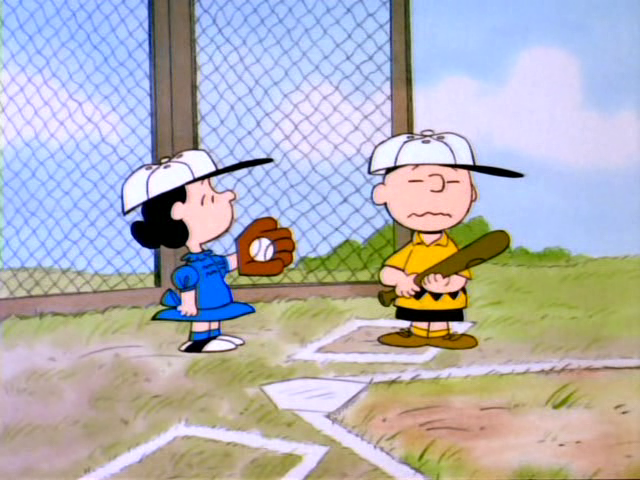 Charlie Brown gives Lucy batting tips. She spends so much time thinking about this that she strikes out. 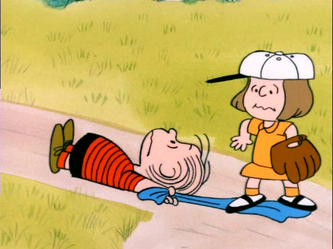 Linus tries to run with his blanket, but is taken down and struck out.Lucy gets more batting tips, and gets a hit, but won't slide into second base because of her designer jeans. 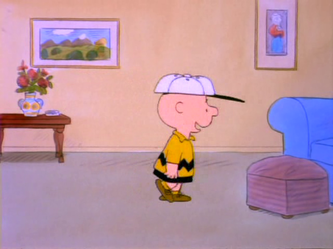 The show ends with Charlie Brown wishing he could win one game. 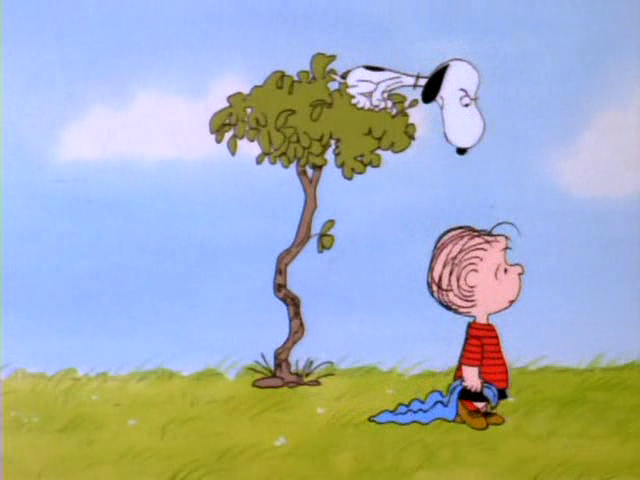 Vulture: Snoopy doing one of his vulture imitations. 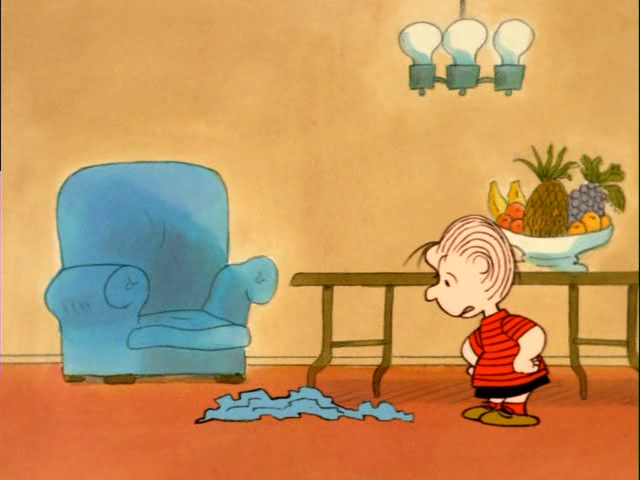 He goes after Linus, of course. 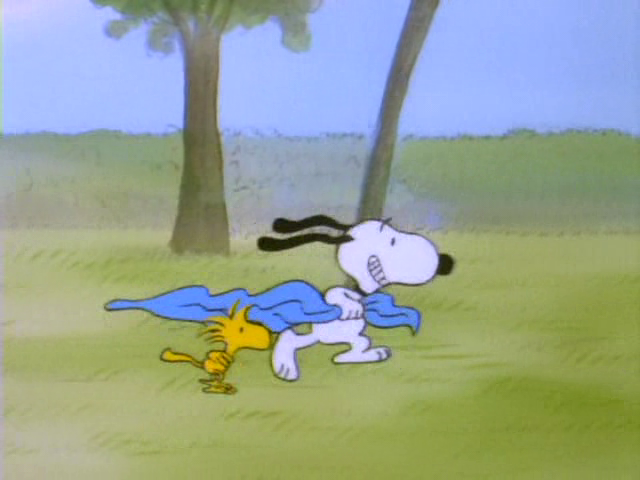 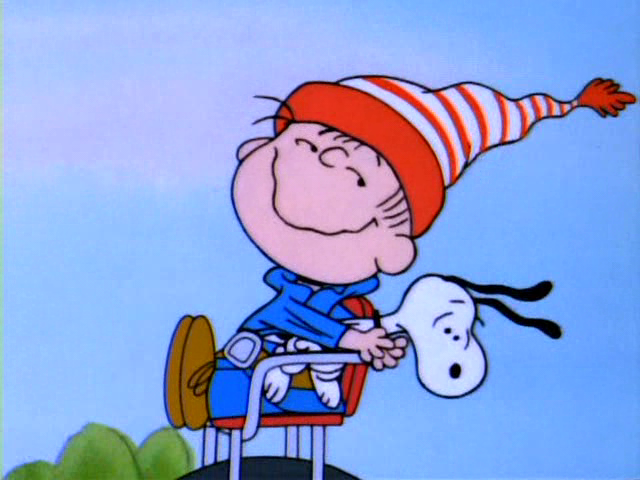 Blanket: The never-ending battle between Snoopy and Linus for the blanket continues. Then, Lucy tries to talk Linus into giving it up. 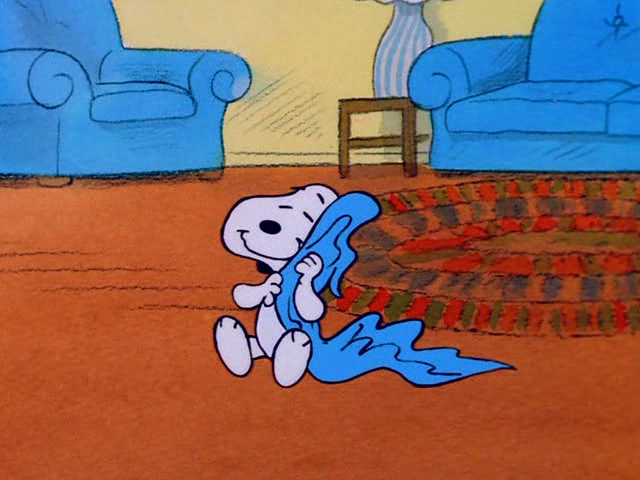 Snoopy nabs it again, only to have Linus steal his supper dish and demand his blanket back in exchange. Linus tells Lucy that his blanket has many uses. Snoopy steals it again, and Linus gets it back. 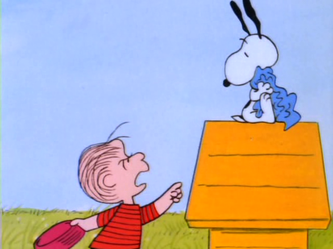 Linus 3, Snoopy 0. 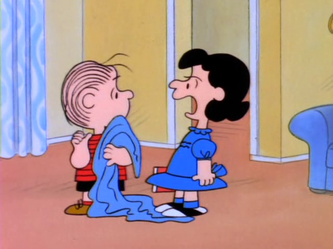 Linus tells Sally that he'll never give up his blanket, which makes Sally ask Charlie brown to slug him, which starts an argument. 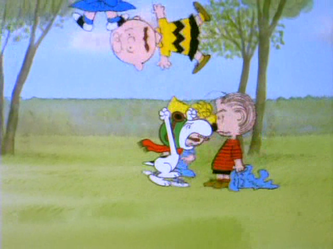 The Flying Ace makes a quick end of the fighting. 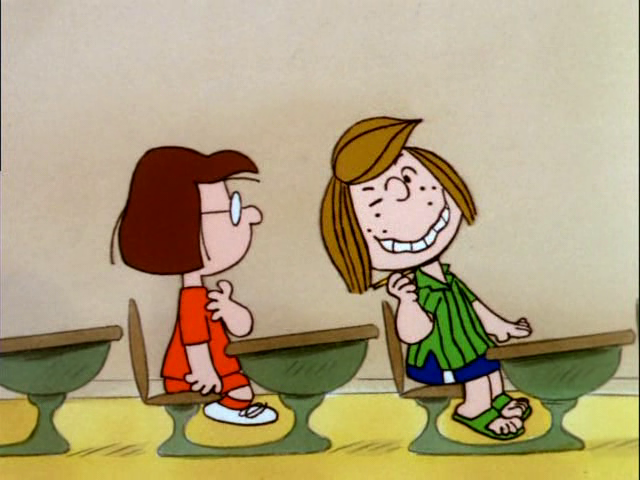 Peppermint Patty: Patty takes a True/False test at school, then doesn't want to go back because she thinks she's getting dumber. 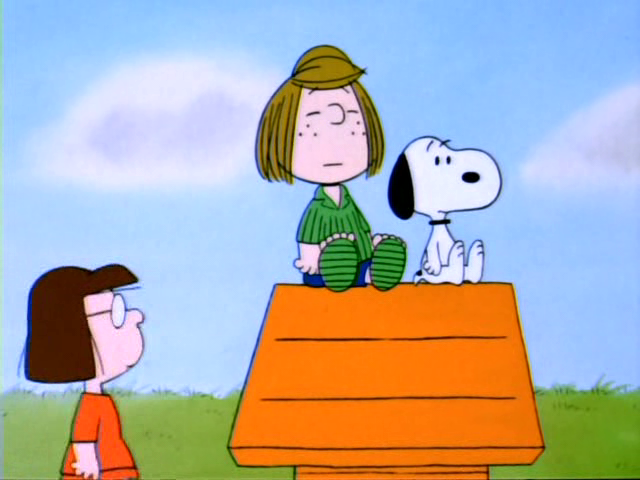 She decides to live with Snoopy, much to his disappointment. 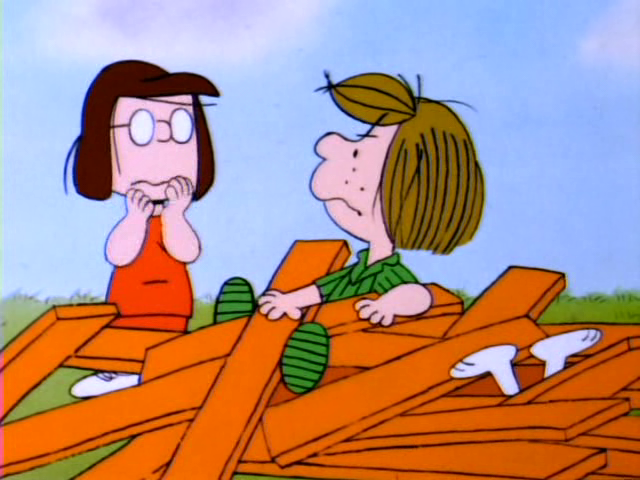 Marcie tries to pull her down after missing a day of school, and accidentally wrecks Snoopy's house. She then arranges to have Patty flown to school by helicopter. Re-Run: Rerun talks about a typical day on the back of his mother's bike. 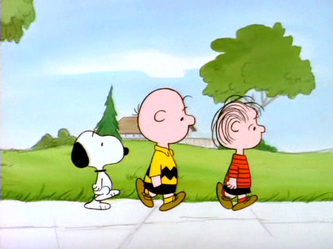 Lucy arranges for Snoopy to ride in the back with him. Rainy Day: Charlie Brown invites the gang over to explain baseball signals. During the entire explanation, he finds that they are more interested in watching TV. 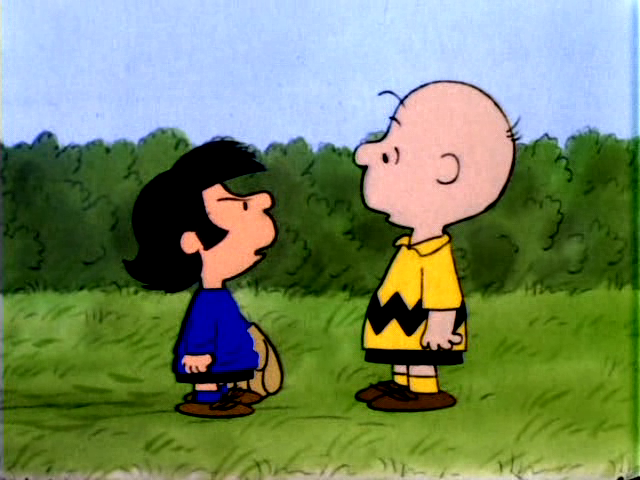 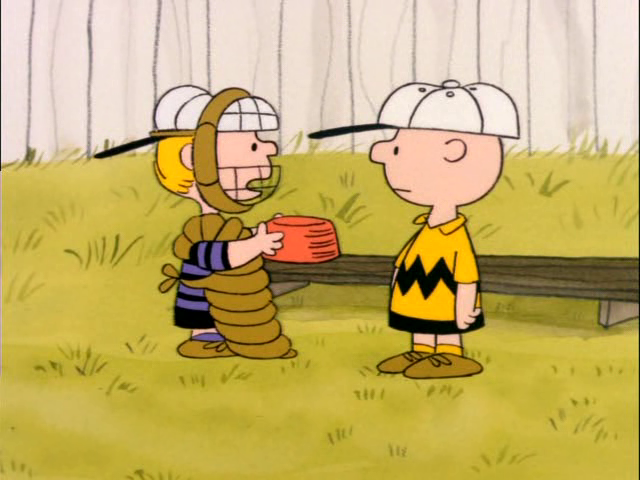 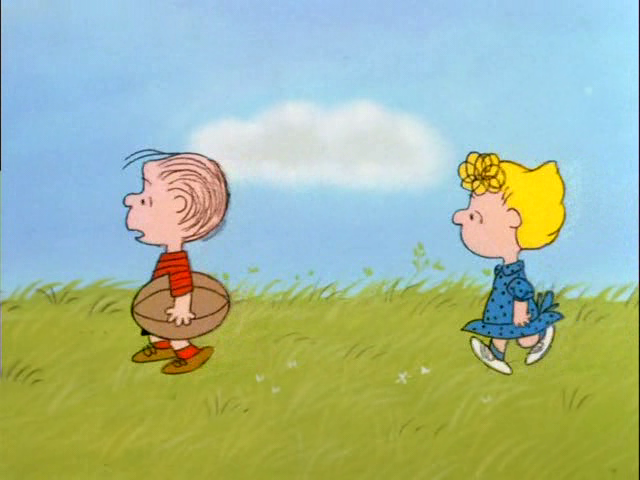 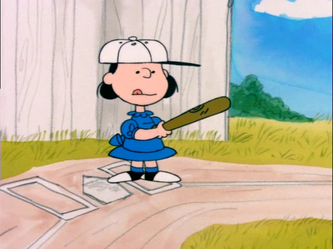 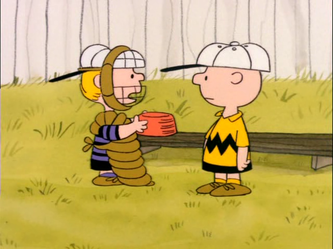 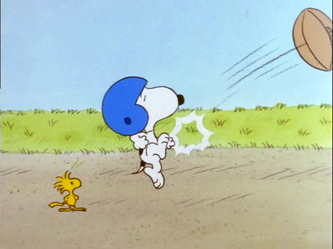 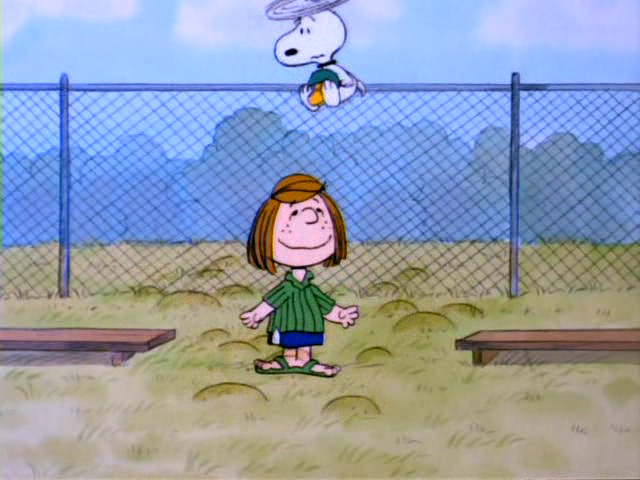 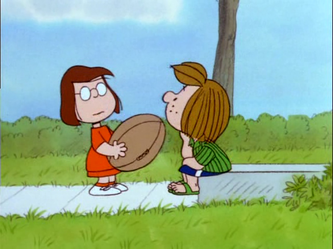 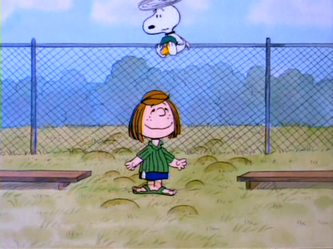 Charlie Brown wants to have Lucy practice catching, and tells he to go far into the field, but the ball goes where she stands anyway. 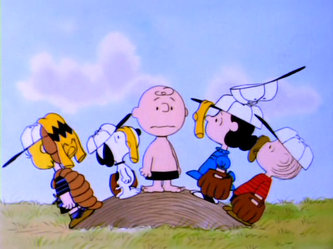 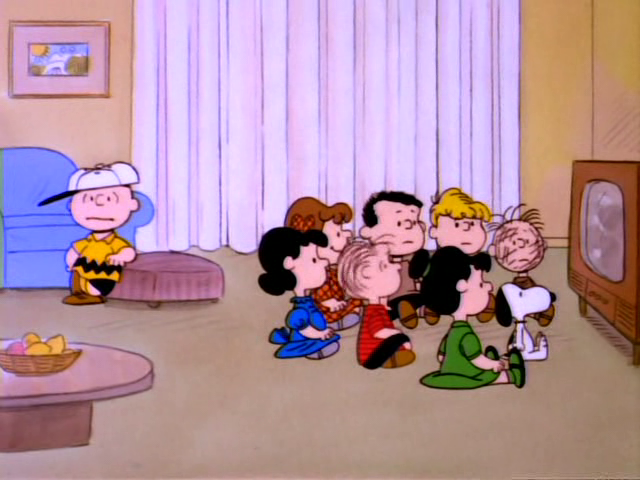 Charlie Brown gives everyone a pep talk and tells them to have some outfield chatter. 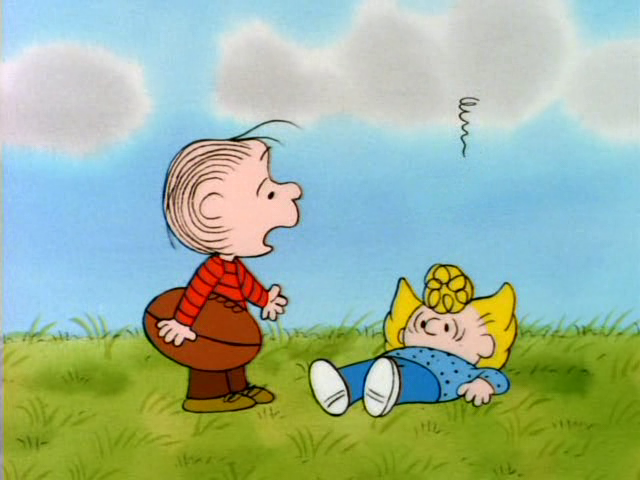 Lucy has a little too much chatter. 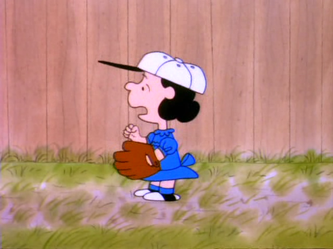 She then causes more problems as the game goes on. 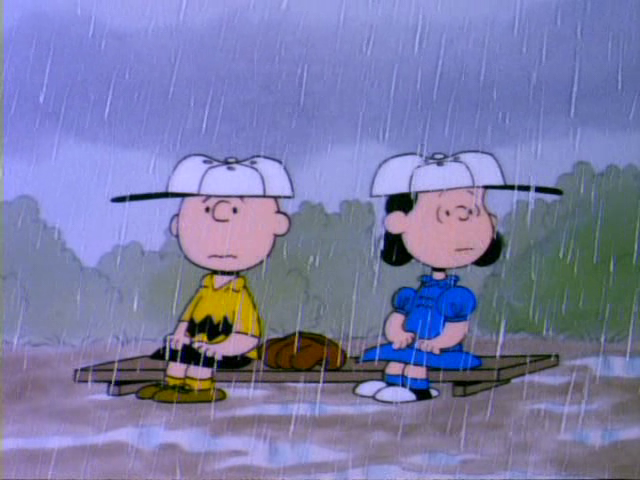 A rain shower finishes the game for the day.